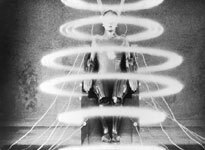 The visual legacy of Fritz Lang's Metropolis has been a considerable one—you can see it in everything from Frankenstein to Bugs Bunny, and most especially on science fiction. Blade Runner, Batman, Modern Times, Star Wars and even Minority Report all owe clear debts to Lang. Its influence is so vast that Metropolis is one of those movies that, even if you haven't seen it, you've sort of seen it. But if you've ever actually sat through the movie—in ragged video releases, or in the peculiar 1984 Giorgio Moroder version, jukeboxed with rock tunes—you'd be hard pressed to make much sense of its story. Visually stunning, yes, but narratively, deeply confusing. That's because the original, twelve-reel cut was hacked up shortly after its premiere in Berlin in 1927. Deemed too long by Paramount for American distribution, it was winnowed down to seven reels, and a new story was provided by Channing Pollack, a playwright who seems to have prided himself on his disregard for Lang's vision. One pivotal (offscreen) character is named Hel, for instance, and Pollack decided that this was too close to "hell," so he jettisoned all mention of her. It's like deciding that Godot is too close in spelling to God, and eliminating all references to him in Beckett's play—how could you possibly make sense of whatever is left? Pretty much you couldn't, and for a good long while Metropolis has been on the short list, with Greed and The Magnificent Ambersons, of films we could never hope to see in their original versions, as their directors intended them to be seen. But the 2001 Berlin Film Festival offered the premiere of a newly restored Metropolis, one that is as close to Lang's vision as we're ever likely to see. Fortunately for us in the United States, it's now receiving a theatrical release over here. The restoration, which began in 1998, was supervised by Martin Koerber; this was a moonlighting gig for Koerber, whose day job is programming the Berlin Film Festival, and this Metropolis appeared as part of a Lang series, along with new prints of M and Dr. Mabuse, the Gambler. (Coming up in the 2003 festival: a Murnau retrospective. Get ready to sink your teeth into a freshly minted print of Nosferatu.) Koerber recently chatted with dOc shortly before the American release of this restored version. You can never be sure just what you'll find up in that pile of junk at Grandma's house—Koerber reports that the script and original score for Metropolis were in the attic of Gottfried Huppertz, the film's composer; the music was re-recorded, and the screenplay became the blueprint for Koerber's restoration effort. Much of the archival work had been done for what has come to be known as the Munich version, which was supervised by Enno Patalas and premiered in 1987. Most of the pieces were in the right place, Koerber observes, but they just didn't look very good: "The Munich version was fine as far as the content was concerned, but the image quality was not very nice all the way through." But with the end of the cold war and the reunification of Germany, archival material previously unavailable in the West was found in the vaults in East Berlin—the pick of the litter for these purposes was unquestionably the original camera negatives for Metropolis. This was for Koerber, as it would be for any film restorer, the professional equivalent of Christmas morning: "It's camera negative. There's nothing better. Of course it had physical damage, which is normal for a seventy-five-year-old negative—it shrunk, it was dusty, had scratches on it, all kinds of things," but the elements were far superior to any that had been previously available. Almost as tantalizing: in a separate film canister were the effects shots that Lang had used, so that Koerber and his colleagues could re-create the original optical print shots for the special effects in Metropolis. These were especially useful for a laboratory sequence, perhaps the most famous in the movie, in which the mad scientist brings his monster to life, the negative for which was particularly ravaged by the years. "We could marry that back together, and come up with a composite that could replace the deteriorated sequence." Even with this negative as a guide, Koerber had to assemble film from various source prints, ranging from Italy to Australia to UCLA. (The Australian print was tinted in a variety of colors, but Koerber feels confident that originally there was no tinting, a process that Lang had jettisoned as early as 1922, five years before Metropolis.) Forty prints of the original release were struck—a remarkably high number for the time—but they seem to have been soon melted down for their silver content, insult to injury, after Lang was excluded from the savage re-editing. A great deal of money was riding on Metropolis, and Lang quickly became persona non grata when his movie failed to perform as expected—Koerber relates that in later years, when asked about Metropolis, Lang would ask back, "Why are you so interested in a film that no longer exists?" Now, it almost does. The restoration team fixed literally thousands of flaws in the negative—torn and missing frames, the ill effects of bacteria eating away at the gelatin, accumulation of dust and dirt, to say nothing of the disregard for 75 years of the director's intentions. The undertaking took four years from start to finish, and this new version of Metropolis is startling and luminous. The newly clarified story plays out as a parable about industrialization and dehumanization, structured almost like a symphony—its sections are entitled Prelude, Intermezzo and Furioso, and as with most silent films, its story defies easy synopsis. Suffice it to say that it takes place in a mythical future in which the masses have been turned into dead-eyed automatons laboring for the obscenely wealthy few, and that class resentment spills over into violence when the son of the factory owner decides to investigate how the other half lives, as he searches for the factory girl who has captured his fancy. No good can come from this, especially when a mad scientist is constructing a Frankenstein-like robot, sort of a prototype for C-3P0, to hasten the destruction of the factory city. The visual legacy of Metropolis has been an enormous one, and it's hard not to wonder what greater influence it might have had in narrative terms had it not been hacked up nearly to the point of being unrecognizable. The new Metropolis still has gaps—Koerber and his team have provided intertitles describing the missing scenes and sequences as the original score plays—and though some stills survive from at least a few of those scenes, Koerber elected against using them, in the manner of the restored A Star Is Born. He very much wanted all the missing scenes to carry equal narrative weight, and didn't want to be perceived as playing favorites. "You could privilege one scene over another, but that doesn't make sense." Koerber made one exception: a still of Hel's grave, an image which exists only in the surviving photograph. Koerber is also keenly aware of the danger of over-restoration, of making the images too pretty, too cleaned up. Obviously Lang didn't have the digital resources that are available to us today, and overzealous efforts to clean up Metropolis could have resulted in an image that bears little resemblance to Lang's original. The slightly shaky camera was part of the style of the film, as well as of the time, and Koerber compensated only for flaws that have crept in with the years: "Everything inside the frame is moving to some extent, but you don't want to stabilize according to the content, or you get a rock-steady image that's completely artificial. Of course you don't want an image that looks like a video image. Basically you only eliminate the bad performance that comes from the film in the gate while printing." Not every last bit of evidence of the passage of time was removed: "There are still some scratches in there," and Koerber's fidelity was not absolute. He was happy, for example, to replace a decaying animated title sequence with a new, computer-generated one based on Lang's original design. And all in all, he is well satisfied with his work, as well he should be. "The new negative, so to speak, as far as one can do that, is a perfect simulation of the original negative, though there is room for interpretation."